Always on the lookout for a different place to dine I was delighted today with my new find, Magnolias which is a former church turned restaurant in Carlinville, Illinois. The church was originally a German Catholic church and I heard about the restaurant and a bit of the history of it from the wonderful Carlinville Writers group (which by the way is really a group of central, southern Illinois writers). The writers are comprised of poets, novelists, short story writers of all genres with an artist or two to boot. The restaurant came about when the Irish Catholic church and the German Catholic church in town merged leaving the German catholic church with the attached church hall empty and ready for its next phase. In 2009 Magnolia’s opened and the church hall became a wonderful restaurant with old world charming decor. They feature homemade soups, salads and scratch offerings. I tried the soup and half sandwich option after a long deliberation. The Lobster Bisque soup and chicken salad were great. “I love their soups and this is the only place I know where I can go and get filled up on a salad,” one of the members of the writer’s group shared. 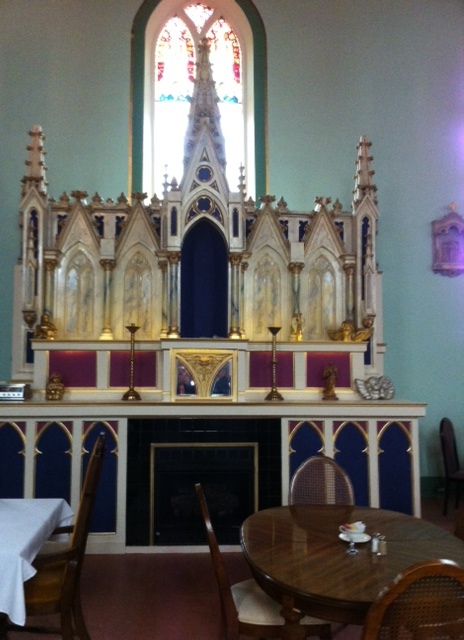 We were able to see the recently finished former sanctuary which has been converted to a banquet hall. The area has been decorated in church style (see photo above) and is a great place for weddings, parties, rehearsal dinners and more. “This would be a great place for my birthday party,” another member quipped. A bit off the beaten path, if like me you are looking for a change of pace, try it out. My mother-in-law loves the place and I have heard through the grapevine that they offer up a wonderful breakfast. Located at 531 S. West St. Carlinville, IL 62626, call 217-854-7167 for details or log onto their website at http://www.magnolias531.com/default.htm. Previous Post: Ode to Gathering of the Green!